What is an “Atmosphere”? 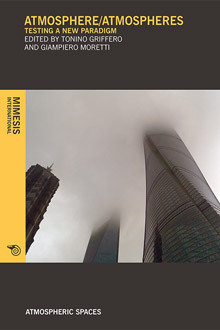 As part of the book series “Atmospheric Spaces”, this volume analyses a new phenomenological and aesthetic paradigm based on the notion of the “Atmosphere”, conceived as a feeling spread out into the external space rather than as a private mood. The idea of “Atmosphere” is here explored from different perspectives and disciplines, in the context of a full valorization of the so-called “affective turn” in Humanities. Tonino Griffero is full Professor of Aesthetics at Università degli Studi di Roma “Tor Vergata”, where he teaches Aesthetics. He has published several books about Hermeneutics, German Idealism and Aesthetics of Atmosphere, and translated a large number of books from German into Italian. Giampiero Moretti is full Professor of Aesthetics at Università degli Studi di Napoli “L’Orientale”, where he also teaches Comparative Literatures. He has published several books about Romanticism and Heidegger, and he has translated large number of books from German into Italian. Beyond Anthropocentrism. Thoughts for a Post-Human PhilosophyForthcoming Event with Sergio Bologna – Freelance work nowadays: what are the challenges for the future?